Long before Lincoln came up with the ill-fated idea to put their name on an F150, someone had already created a far superior Lincoln product with a bed. 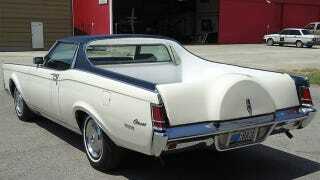 Behold the Lincoln Continenchero, a well executed example of the land yacht era car/truck Lincoln never made. Just when your jaded eyes think you've seen everything the world of custom car/trucks has to offer something like this Lincoln Continenchero comes along and makes weird custom –aminos and –cheros new again. Someone started with a 1971 Lincoln Continental Mark III and after considerable effort and time ended up the unique result you see here. Currently listed on Ebay, this is the first Lincoln of this era we've ever come across with the Ranchero treatment. According to the seller the Continenchero was "professionally built and they used to call them the Farm and Ranch special". While we don't doubt it was a professional who undertook this conversion, we are skeptical enough Continencheros were built to have their own title. After a little research left us with no information about who built these (anyone know?) we feel safe guessing this hot rod Lincoln is one of a kind and happened to find a set of emblems from a late ‘60s Ford truck equipped with the "Farm and Ranch Special" package at some point. Less important than who built it is the fact that someone built it, and it appears they did quite a nice job. Who would have ever known the lines of a 1971 Lincoln could work so well for Rancheroization? According to the seller over $22,000 worth of receipts come with Continenchero, many of which are the result of a cosmetic restoration in 2005. After daily driving this beast for a few months we imagine a similar dollar amount in fuel bills, courtesy of the 365 horsepower 460 V8 under the hood of the Continenchero. If you can afford the fuel and don't mind becoming intimately acquainted with early 70s electrical systems (the power seats and windows are currently inoperable) this could be the one of a kind Rancheroized Lincoln of your dreams. With a few days left the Continenchero has been bid up to $5855 but we have a purely speculative hunch the reserve is a decent bit more than that. Whether it sells or not, this Lincoln is perhaps the best example we've seen (at least since the E46amino) of what can happen when talented builders and luxury cars never intended to be trucks combine.